follow We have reached the ending of a very busy, stressful, and emotional day. It is strange that I am typing this at 5:00 p.m. local time and it feels like it is approaching midnight. First of all thank you to all of the family, coworkers, students, friends, and strangers that spent the better part of the day sending up calls for guidance,skill, and relief for both Emma and our family. I think everyone should get to experience the feeling of such unending love and support that was bestowed upon my family once again today. 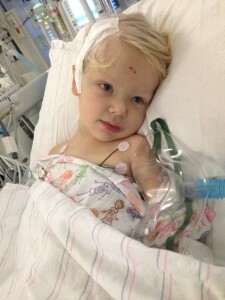 We heard from people from across the country that were praying for a successful surgery. God was definitely present in the surgical room as the procedure was taking place. We do not take for granted how positively this surgery went. There are many kids out their that don’t even make it through one brain surgery and our Emma now has two under her belt. medicare drug coverage viagra As far as how the surgery went, Dr. Goumnerova described Emma’s tumor as being even bigger than it was the first time that she had surgery done. We understand that there is a lot more room for the tumor to expand now that Emma has grown so much but am quite disheartened that even though Emma has been on three different chemo regimens the tumor has gotten back to the point that it was prior to surgery. Why is that?? Dr. G. noted that the major difference between this time and last was that there was a lot of “dead” tumor up in the brain, which indicates that the chemo or chemo’s may have been working but the tumor grew anyway. Was this because only one of the chemo’s actually worked and the tumor grew during the other two chemotherapy’s. Nobody knows at this point. The only thing I do know is that we need to find a chemo that is going to work for the long term. Emma is a tough individual, but I don’t want to expose her to this type of surgery every one or two years. order generic viagra The tumor that remains in Emma’s skull following the procedure is very comparable to the first surgery. Dr. G felt that even though she hadn’t compared previous scans yet, she did feel that she was forced to leave a little more there this time than last. A portion of the tumor was frozen and sent off for testing and analysis to make sure that the doctors are aware of as much information as possible about the tumor. viagra side effects with other drugs The next couple days will be difficult as we try to diagnose any new concerns and track her ability to gain new strengths over the coming days. The doctors are hopeful that we will see improvement as the brain tissue was rather rapidly expanding once all of the pressure was relieved. Dr. G. seemed quite impressed with the level of pressure that Emma was dealing with (I’m not sure Mom and Dad would use the word impressed). click Thank you again to all who were pounding on heavens door for a miracle for our Emma. We love each and every single one of you that take the time to follow Emma’s story. follow site If you could do us one major favor. If everyone that reads this note shares and spreads the message for drastic improvements that need to be made in the handling of Pediatric Cancer Awareness we WILL make a major difference. Share the message throughout the month of September as we enter Pediatric Cancer Awareness month. These kids need your help. Surgeries like the one Emma went through today are not acceptable, and if we as a country put our mind to it we WiILL find a cure. source link I apologize for any typos and errors. It has been a very long day. Love you all.